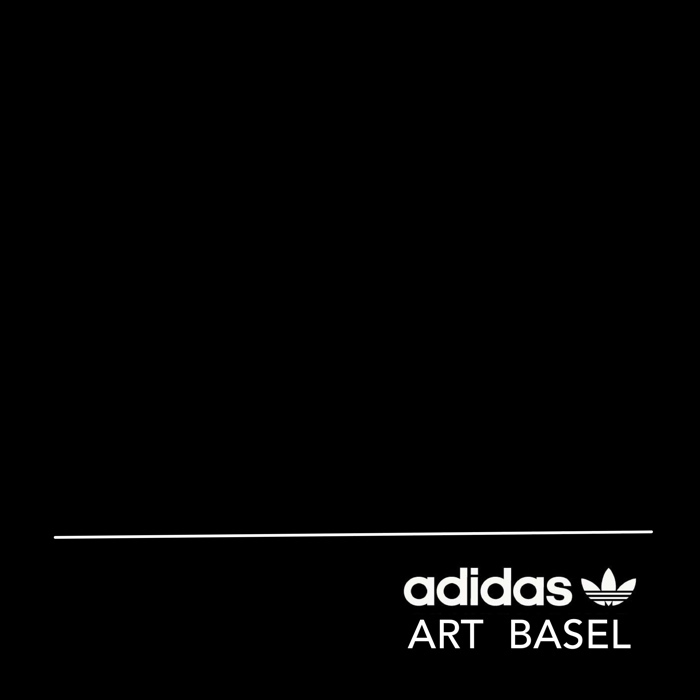 Art Basel is suing Adidas for trademark infringement over these kicks. 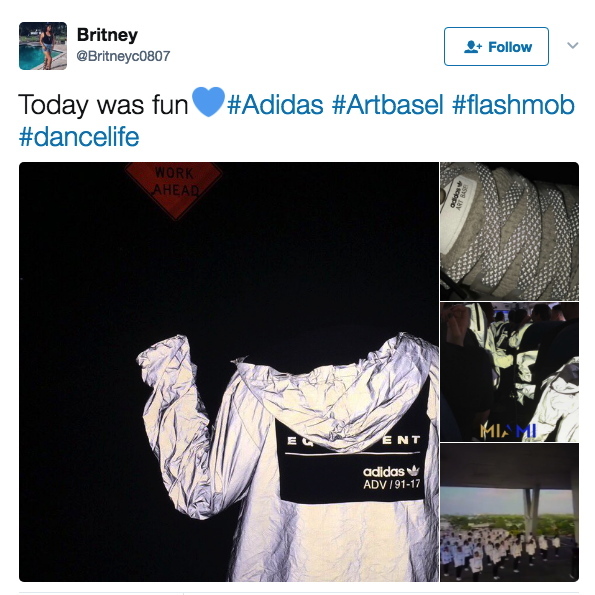 A thousand pairs were given away at a string of branded flashmobs in Miami on November 30th, two days before the opening of the art fair they had no official marketing agreement with. Is there a term for astroturfed flashmobs? Is there any other kind these days? 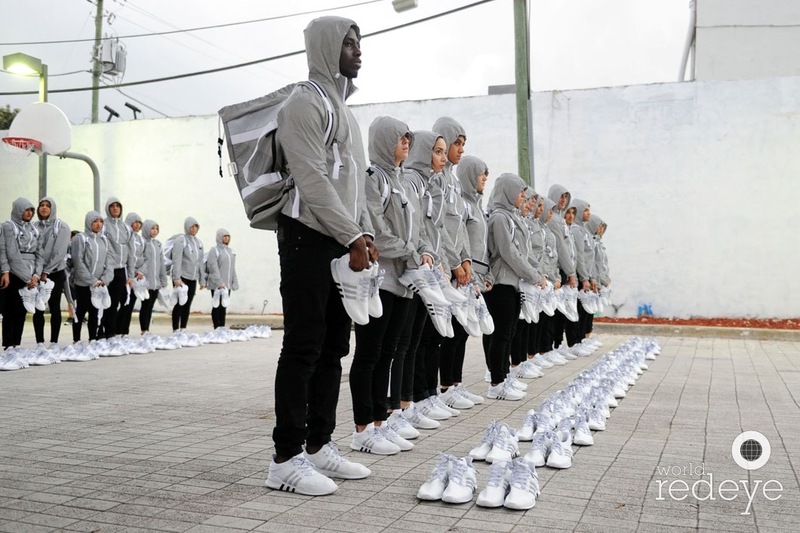 Did you know Adidas been hypin’ kicks at #ABMB since at least 2010? Does a viral flash mob still count if you have to Google it? Anyway, 2016. According to hype groupies like high snobiety and World Red Eye, a mirror-wrapped school bus drove 48 performance artist/brand ambassador/whatevers around town. Stops included a high school in the Design District, HdM’s parking garage, and some millennial-branded Hilton in South Beach. They were decked out in #monochromatic reflective gear. 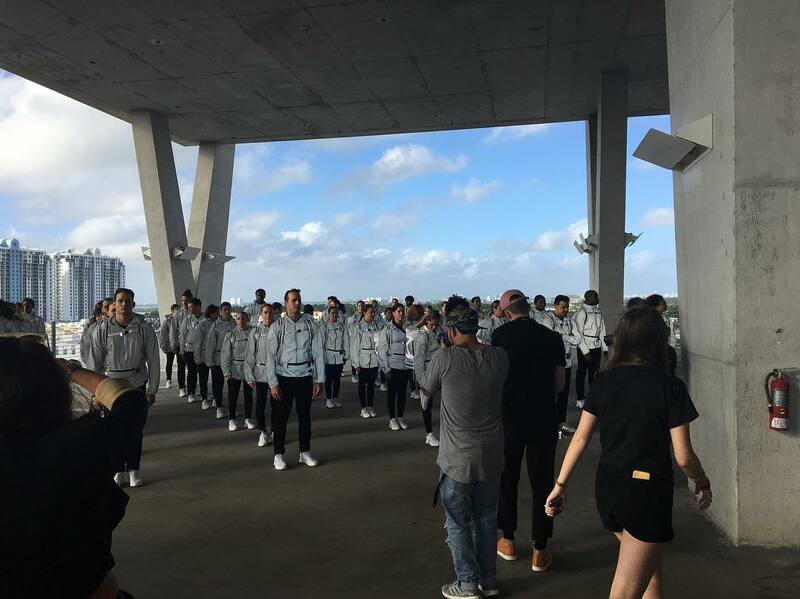 They stood in formation, Vanessa Beecroft-style. They did some dance moves. 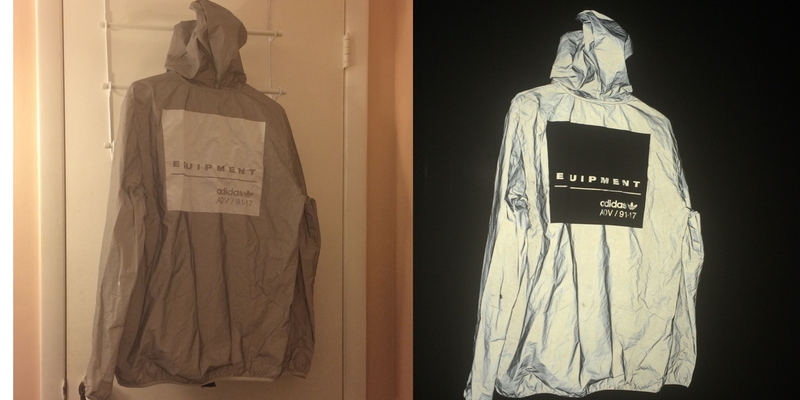 Ideally, their gear did its retroreflective blast out thing when it was photographed. Then they unloaded their loot, lined it up like a freakin’ Eleanor Antin street team, and, I guess, handed it out to the ‘gramming masses like rations off the back of a UN truck. Then everyone started flipping their swag on eBay. It’s hard to say where the stunt’s brand impact actually landed the hardest: on the 1st-to-know sneaker chasers, the day-of hashtaggers, the eBay resale remoras, or now, on the so-DGAF lawsuit bad bois. 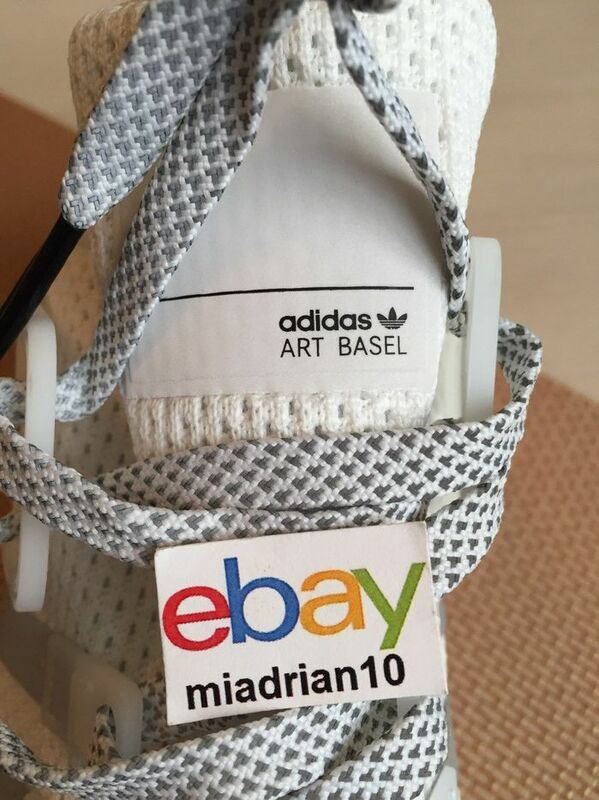 Art Basel is suing over the tongue tags on these free sneakers, and in addition to brand damages, is demanding Adidas destroy all the infringey sneakers it still has. If you budget for ex-post trademark settlements, is it actually a bootleg? 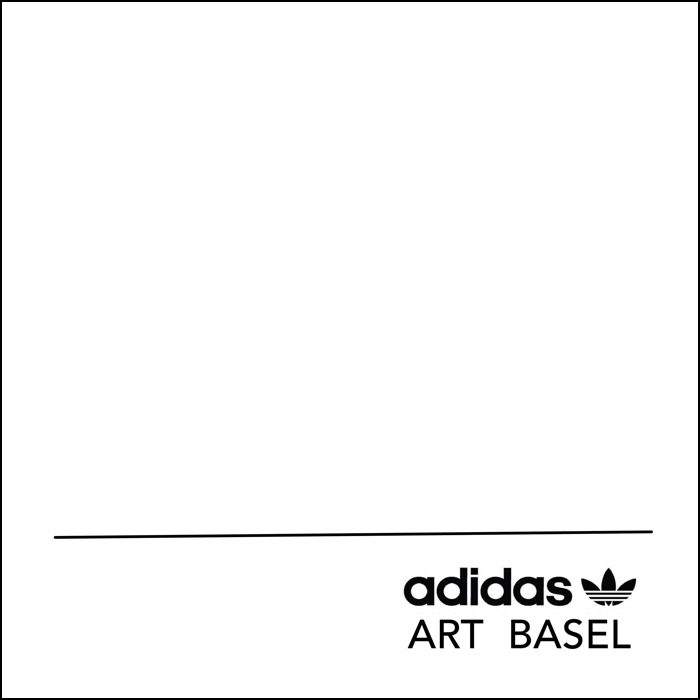 Untitled (Adidas Art Basel) is a series of 1,000 numbered paintings based on this tongue tag composition, made in various sizes. Or should I say they will be made. Might be. Conceived to be. I know what I’ve written about artists having a successful system, but honestly, it’s debatable whether the world needs 10 more paintings at all right now, much less 1,000. Of these. Can you even imagine having a thousand of these paintings lying around? You literally could not give them away, lawyers or no. Or maybe you can? Just put a few hundred super-shiny posters in a stack and BAM, you’re in Venice. Ima get to work on one, see if it delivers that retroflective kick the study’s promising. Then I’ll let my estate sort out the rest.